Free Priority Mail Shipping ! 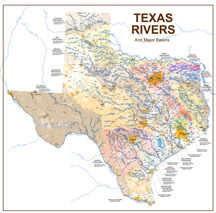 This color coded watershed map shows where every raindrop in Texas ends up. Every river and major creek appear. A photo base underneath shows every town and most roads. This high resolution photo imagery shows every house and building. Water bodies are labeled down to cove level. The Guadalupe below Canyon Lake has mile markers for 23 miles with access points and river outfitters shown. It is printed in a unique folded compression perspective that allows 23 miles of river without being too long. 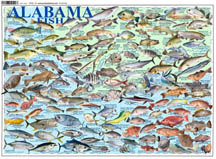 This shows nearly all fresh water and saltwater fish that have state records. The fish name, record weight and location caught are shown next to each fish. The fish images are actual photos (not drawn).